Spelunky first appeared on the PC back in 2008. It's a puzzle plafromer made up of randomized levels and death is always a whisper away. As players progress through the destuctible environments they'll unlock secrets and other goodies. This July the game will be getting the Xbox Live Arcade port treatment, featuring "new graphics, music, zones, monsters, items, traps, and secrets." Of course this time it won't be free. That's why there's all the extra stuff. Now up to four players will be able to play deathmatch and co-op locally. There are even bots avaiable for those who like to deathmatch against souless opponents. 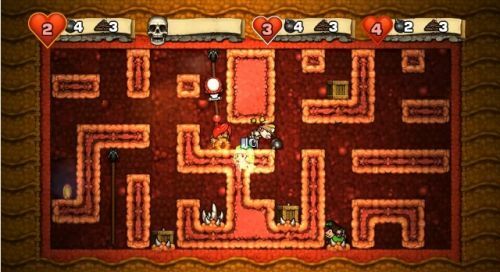 Spelunky supports four player local co-op. It will be available on July 4th through the Xbox Live Arcade. If you can't wait, you can pick up the free PC version now.